Your diarist can say this without fear of contradiction because Queen of the Boards Bond has played moneybags widow Lady Rosamund in Downton Abbey on ITV, her Maj in Sue Townsend's The Queen And I on Sky One, as well as becoming Juliet opposite Mr Kenneth Branagh's for the RSC (for any non-luvvies among you, that's the Royal Shakespeare Company) in 1986 in Romeo and Juliet. And, of course, Moneypenny opposite Drogheda's very own Mr P Brosnan in four 007 movies. The good news I'm about to tell you will leave luvvies and fans of great theatre alike shaken and possibly stirred: Samantha Bond will play the leading role of Amanda in the Gate's new production of Tennessee Williams's The Glass Menagerie. The play, which has its illustrious premiere on May 1, will feature, as well as Samantha, Marty Rea, Zara Devlin and Frank Blake, costumes designed by Lorna Marie Mugan, famous for her period costumes in Peaky Blinders. And doesn't Camille's beau Aidan look fetching in them? 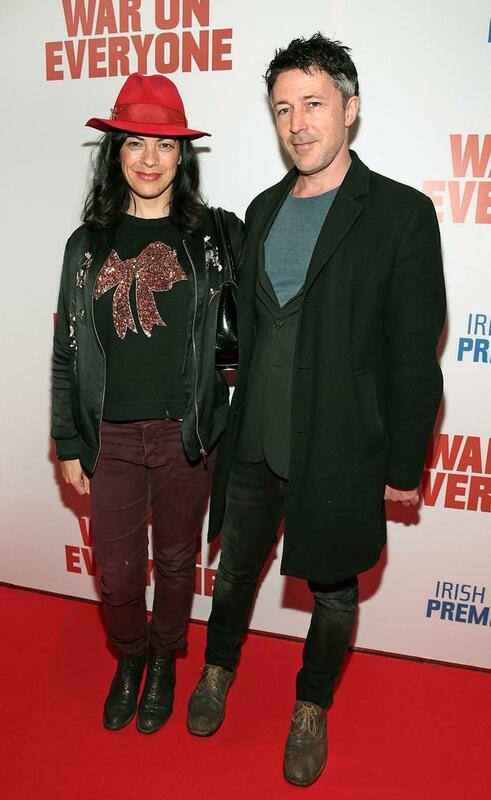 Everything was on the up and up Down Under for our own Camille O'Sullivan. Ireland's finest chanteuse played two sold-out concerts last weekend at the Palais, a floating venue, at the Adelaide Festival. "The gigs were absolutely amazing. Standing ovations every night," Camille told me before she got on the plane to fly home. The audiences in Australia didn't want her leave. This was matched by the reviewers. As one wrote: "Hearing O'Sullivan was like witnessing a reincarnation of the most extraordinary female vocalists. At times she had the storyteller's talent of Patti Smith, the timbre of Marianne Faithfull, the deadpan of Nico and then the jet-engines started to roar and we got a touch of Janis Joplin." The journalist then added of Camille's spellbinding interpretation of Nick Cave songs: "Where Cave longs to see the face of God, O'Sullivan danced last night with the ecstasy of one who has seen him and lived to tell the tale." When Camille's plane touched down in Ireland, she told me: "I missed my daughter Lila terribly. I'm dying to give her a hug." Camille's laconic other half, Game of Thrones and Peaky Blinders superstar Aidan Gillen, accompanied her on the trip to Oz. They flew back into Dublin last Thursday morning via Dubai and London. Camille and Aidan had enough energy to perform In Dreams together on The Ray D'Arcy Show last night, to promote the Sunday Independent's annual Rock Against Homelessness charity concert. Now in its fourth year, the concert - in aid of Focus Ireland, is at the Olympia on April 23, where Camille will be headlining with some special guests. This is to say nothing of her fella Aidan (who will duet again with Camille on In Dreams, which is being released on vinyl for Focus Ireland). The legendary Pat McCabe will do a monologue, plus there is Duke Special, Natty Wailer, Tommy Fleming, The Celtic Tenors, and last, but not least, the telly megastar Laura Whitmore as MC, along with 2FM's hipster-king Eoghan McDermott. Cadbury is proudly sponsoring the charity concert and it promises to be a sweet night for a great cause. Hugh Laurie described the feeling of his "senses being alive", driving his motorcycle through Beverly Hills in the early morning - "and all the sprinklers have turned off, the scents that wash over me are heavenly". Robbie's beautiful other half, looking stunning in a black mini-dress, was out with Kathy Hilton and her daughters Paris and Nicky. They all had dinner at the Beverly Hills Hilton, hosted by fashion brand Balmain. They all sang Happy Birthday to Kathy. And why not? I can only hope that they sang with the same gusto as the 70 guests at the 90th birthday party for the great Dr Ivor Browne in Rasam, Glasthule last Monday night. Meanwhile on the previous night - St Patrick's - Dancing with the Stars dancer Ksenia Zsikhotska celebrated her birthday in 37 Dawson Street. The Ukrainian beauty was joined by fellow dancers Ryan McShane, Giulia Dotta and Kai Widdrington. Last year's celebrity dancers Thalia Heffernan and Des Bishop also pitched up. That first Easter must have been awkward, some wag once quipped, because you know the apostles had already divided up Jesus's stuff (because he came back, sillies). Imagine how awkward it is for Fine Gael Messiah Leo Varadkar at this time of year. With the Great British Break-Off becoming perilously complicated, he can hardly be seen on the town with Matt. How would it look for An T to be spotted grooving at Drake after coming from a meeting with Madame May after warning against a "rolling cliff edge". I was unsurprised by his answer when asked was he going to any concerts: "Nope. All Lent and Brexit for next few weeks." What was he giving up? "Alcohol. Do it every Lent. Except St Patrick's Day. Not a religious thing."